Hopefully this OT•com timeline thread will help chronicle just some of the rich history from this immense and unique site - from humble beginnings as home and beacon for the petition - with also becoming an effective resource for the fan pressure campaign shortly after - to then becoming a community hub for many like-minded Star Wars fans in general. It’s further evolution over time to be a home for some superb and varied fan preservations, fan edits and projects - plus documentaries, technical, audio, and archival endeavours etc. As well as discussing some of the more prevalent news and events from in and around Star Wars since 2003 (or maybe 2002…), and also some of the other intriguing ventures from Star Wars fandom since. The vast majority of the following text has been taken from zombie84’s educational and informative SaveStarWars.com website; from an editorial piece here - link - and abridged, edited & updated for use here. Please click the link to read the full original article. More details can be found below. There are also ‘Further Reading’ links to SaveStarWars.com articles throughout - giving more in-depth insights on various subjects. On May 25th, 1977, a film opened in 32 theaters in the United States and changed not only the movie industry itself, but the popular culture unto which it was released. STAR WARS not only quickly became the pop fad of the summer of '77, it endured as a monumental and historical achievement in cinema, not just as an entertainment piece of great cultural value, but as a “blockbuster” or “popcorn” film, as a special effects extravaganza, as a sci-fi fantasy picture, as a franchise, as a cinematic epic, and as a classic of American film - as well as later appealing to audiences all over the world. By the end of the year, it was the most financially successful motion picture of all time, and at the Oscars it saw nominations for Best Picture, Best Director, Best Screenplay and Best Supporting Actor, among an additional seven which it won. Simply put, STAR WARS is one of the most influential films ever made and quite possibly it is the most popular singular film of all time. Star Wars was the first VHS to make $1m+ in rentals when it came out in 1982 - although technically, this was not the original version either, for in 1981 the subtitle “Episode IV: A New Hope” was added to the title crawl; but, barring this single, rather insignificant change, it was the same film. Star Wars and its two sequels, the EMPIRE STRIKES BACK (1980) and RETURN OF THE JEDI (1983), were not only three of the most popular films in history… until the late 1990’s, they all occupied the top ten box office list - having a significant impact on popular culture and film-making since their release. Also in 1993, Lucasfilm and Fox began discussing the upcoming 20th anniversary of the original film. “One of the reasons I chose to reissue the films rather than do a convention or one of the other things that was suggested for the twentieth anniversary was at the time we thought about all of this I had a two-year-old son,” Lucas would later explain. "And I thought, ‘I’m not going to show him the film on video, I’m going to wait and let him see it on the big screen the way it was meant to be, and let him really be overwhelmed by the whole thing.’ Lucas remembers in 1997: “This was supposed to be a nice little twentieth anniversary for the fans.” Lucas had also long complained about a compromising 1976 shoot, and surmised that perhaps a few special effects could be added or cleaned up, similar to the way Steven Spielberg had done with his Close Encounters ‘Special Edition’ in 1980. The ‘Special Edition’ was slowly growing in scale. Lucas was eager to use new CG technology - he had just announced he was making the Prequel Trilogy, and the ‘Special Edition’ of STAR WARS was free research and development since Fox was paying the bill. “We called it an experiment in learning new technology,” Lucas says, “and hoped that the theatrical release would pay for the work we had done.” Many new insertions were decided upon the basis of their usefulness as learning tools - how to do crowd replication, how to handle extreme close-ups on CG characters, etc. Many fans felt non-plussed by many of these new additions - Greedo inexplicably shot (and missed, from just two feet away) before Han shot in order to “soften” Han’s character, “kiddie” humor is abound in slapstick CG droids, and even the long-awaited Jabba scene disrupted the pace, gave redundant information, showcased a lacklustre CG model, and had Boba Fett posing for the lens. The term ‘Han Shot First’ would become a popular mainstream rallying call - highlighting that significant alterations were being made to the these icons films. Fan-made merchandise with ‘Han Shot First’ became widespread to the point where even Lucas himself some years later would wear a t-shirt (ironically?) sporting the phrase. Yet, in spite of some mixed opinions about the changes, the main reason to go see the ‘Special Edition’ release for many fans was a chance to see the Original Trilogy on the big screen once more, and to that end it was a remarkable experience that brought in more money than all but the top six films that year. The public - not just “fanboys” - loved the chance to see the films again on the big screen. 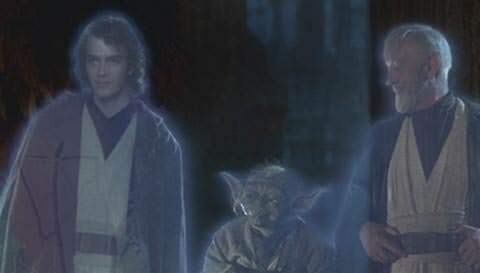 Lucas had just purchased the copyright to STAR WARS from Fox, and when the films were re-issued on VHS in 2000 the boxes had now removed the label of “Special Edition” - but not the content; and the film still claimed 1977 as its release date. Critics and audiences asked Lucas if the original would be released… for many, this was the film of their adolescence, and an edit of the movie deemed superior by just about everyone, aside from its historic value. But Lucas refused - for him, he felt that the original was now a half-complete embarrassment. Moreover, he hoped that the ‘Special Edition’ would better integrate with the Prequel Trilogy he was releasing, so that the six film cycle could be seen as a more singular entity, and with all the criticism the Prequels received, seemingly became all the more stubborn and defensive that this should happen - in spite of what the rest of the world thought (and release both versions). By 2001, VHS had been replaced by DVD - yet STAR WARS remained mysteriously absent from the new DVD format. Lucas’ plan to not release the films on DVD until after 2005 (after The Prequels had been released). When DVD officially overtook VHS in sales in 2003, Lucas finally relented - yet the original version of STAR WARS was in more dire straits than ever. A second ‘Special Edition’ was quickly put through for a 2004 DVD release - this time, plagued with color errors and timing issues that even the most ardently stubborn devotees of Lucas had a hard time appreciating this as a ‘Special Edition’ (unless fans consider Darth Vader’s now pink lightsaber is a superior artistic choice?). The original theatrical version, of course, was once again suppressed in 2004 DVD release. Yet Lucas went even further - seemingly trying to eliminate these OOT versions from existence. Prints from the OOT were recalled from circulation, and Lucasfilm only lent out 35mm prints of the ‘Special Edition’. There has been at least one documented instance where a theatre tried to screen a print sourced from collectors, as Lucasfilm refused, only to have official reps waiting to confiscate the print and shut down the screening. When American Cinemateque screened the film with a Q&A with model-maker Lorne Peterson as part of their tribute to ILM’s pioneering FX in the mid-2000s, they were forced to screen a version of the film that only contained roughly 30% of that original groundbreaking work! By this time, fans were so disillusioned that they had actually formally organized themselves. OriginalTrilogy•com had been formed back in 2002 (coming online in 2003), offering a petition of signatures by fans to Lucasfilm asking for the original theatrical versions of the trilogy to be released due their treasured status with fans and historical significance in the medium. By 2006, OriginalTrilogy•com’s petition had astoundingly garnered over 72,000+ signatures - a remarkable sign of how beloved the films were. Due to this fan pressure campaign, Lucasfilm VP Jim Ward begged Lucas to release the original theatrical versions. There finally was a small compromise - a release of the OOT as a “bonus feature”; a master tape of the transfer done 13 years earlier, in 1993, for Laserdisc was pulled out of a dust bin from the Lucasfilm archives and included as a bonus feature in a 2006 DVD re-release of the ‘Special Edition’, in a non-anamorphic letterbox format. This blatant disregard and disrespect for the film angered not just fans but film buffs around the world, naturally. 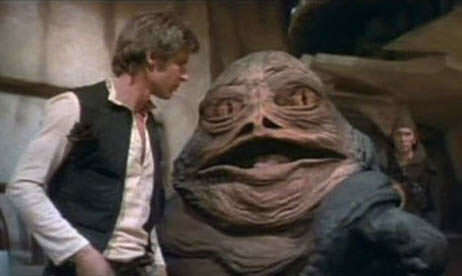 After a massive fan letter-writing campaign, Lucasfilm finally responded to the criticism, saying that the 1993 tape represented the best source of the originals - a claim obviously not true and reflecting Lucas’ attitude to those fans who wished to have the opportunity to be able to see the original theatrical versions. Renowned film restorationist Robert Harris - went on record saying he knew for a fact that there were pristine master 35mm elements available and that he would fully restore the original films! Lucasfilm did not respond to his offer. Lucas’ refusal versus the demand of audiences has also sparked debate about artistic merit and respect for the intentions of the artist. No filmmaker is ever totally satisfied with their finished work, which is part of the drive to work on a next one - Alfred Hitchcock is famous for having remarked when asked what his favorite film of his was: “the next one.” The fact is that, regardless of whether Lucas likes it or not, STAR WARS was released as a finished product in 1977. It is 100% faithful to the shooting script, and on a technical level was the most advanced display of graphics ever made at that time. It was not “unfinished” in this sense, rather it simply was a product of the era that produced it. Furthermore, the ‘Special Edition’ has gone far beyond “completing” anything - his insertion of Jar Jar Binks and Hayden Christensen was obviously not in his mind when he made RETURN OF THE JEDI in 1983. Moreover, EMPIRE and JEDI were not even directed by him - while he is undoubtedly a primary creative force behind the franchise, these films are not “his” in this kind of direct sense. EMPIRE director Irvin Kershner, for example, maintained when he was hired in 1977 that he must be able to have artistic control over the production: “It’ll be your film,” Lucas told him. Lucas states to Rolling Stone on June 12, 1980: “It’s truely Kershner’s movie.” Furthermore, JEDI director Richard Marquand passed in 1987 (Kershner in 2010). Lucas today represents a totally different person than the rebellious anti-establishment 30-year old of 1977 - and many of the changes are simply revisions, NOT completions. The original award-winning work of the many artisans, sound technicians, craftsmen (& women), model makers, special effects artists, editors, and the talented crew’s priceless contributions increasingly lost - seemingly permanently… to ill-fitting mid-1990’s CGI and substandard efforts that have since themselves been replaced in latter changes to the ‘Special Editions’. HelloGreedo has a superb ‘Star Wars Profiles’ youtube video series, featuring some of those in front and behind the camera from the Original Trilogy films, which is full of informative insights and information - link. The fact is that, if so many people enjoy the originals theatrical versions and would like to see them, wouldn’t that please a filmmaker? One of the reasons no other director has refused to release a version of their film when there has been so much demand and love for it is precisely because of this. Ridley Scott hates the theatrical cut of BLADE RUNNER, and as one of the most powerful directors in the world he would have the ability to maintain it not be released - but many people either enjoy it or would like to see it simply for posterity, and that is not anything to be bothered by. No one ever has suggested that the ‘Special Edition’ - Lucas’ “Director’s Version” - be suppressed, or replaced. That a filmmaker gets to re-shape their film the way they want is a great privilege that every director should enjoy, and no one should deny Lucas this. The issue is: releasing the theatrical versions does not nullify the director’s cut. Everyone would have treated the ‘Special Edition’ as the final artistic statement of the director. They can both exist. In the current era of home video, there is no relevance in any argument that relies on only one version existing. The theatrical versions of the Star Wars Original Trilogy are important classics of cinema. 2011 saw the Original Trilogy released on the blu ray format for the first time - featuring only the ‘Special Editions’ films once again - and along with even more numerous changes made to these editions of the movies; including yet further changes to the ‘Han / Greedo shooting in the Cantina’ scene. (For the 2015 Digital release there were changes to the iconic 20th Century Fox opening logo and fanfare - removed from all the OT films, except Star Wars '77, of which Fox still owned at the time). While the ‘Special Editions’ are the same basic films… they do NOT in any way represent the look or experience of their original groundbreaking theatrical releases. This is an important issue in contemporary cinema, especially because, unlike any other films of historical significance that have not been restored (DVD & blu ray have offered remarkable historic preservation of all the major classics), they are not being withheld due to neglect by the studio but due to a crusade of deliberate revisionism. This suppression of some of the cinema’s classics represents a stain against our cultural heritage, a reflection of our society, our technology and our values. As custodian of national treasures, there is an ethical mandate to preserve, protect, and display these works for the public good. Perhaps it is time George Lucas himself, or Lucasfilm & Disney, to re-examine his beliefs? 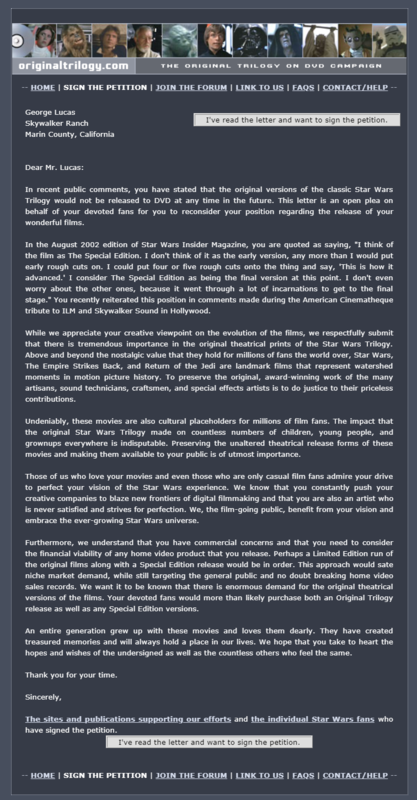 As stated above, the vast majority of the above text is abridged and edited (& also re-formatted and updated) from zombie84’s superb 'How the Grinch Stole Star Wars’ editorial piece on his quality SaveStarWars.com site - an excellent resource of information for any Star Wars fan. The site provides an absorbing and comprehensive look (presented clearly and concisely) - chronicling and illuminating the behind the scenes history of the Original Trilogy films - along with the changes and revisionism surrounding them. All credit goes to zombie84 for his exhaustive investigative endeavours - and please visit his site linked above to view the full original unabridged & unedited article. Be sure to also check out his website’s intriguing and informative FAQ, Editorial and Resource sections too. 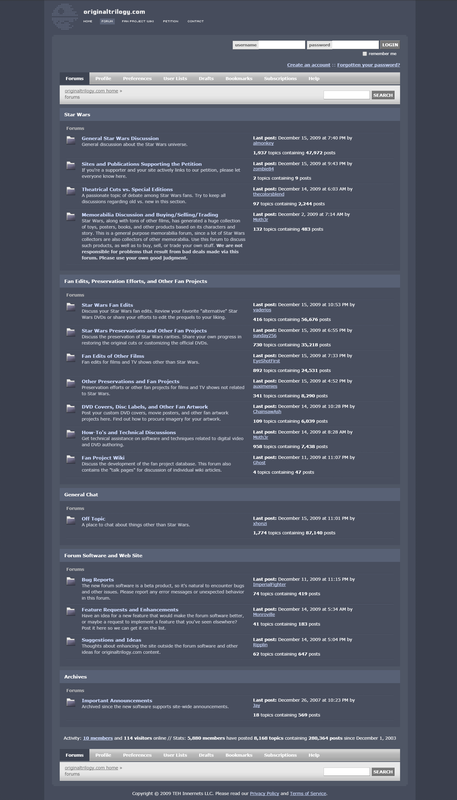 An OT•com thread on zombie84’s SaveStarWars•com website can be found here - link. zombie84 also released a comprehensive and highly regarded book in 2008 - ‘The Secret History of Star Wars’. An OT•com thread of which can be found here - link; AudioBook thread : Amazon book (also available for Kindle & Audible), here - link; and Barnes & Noble book, here - link. zombie84 also has a youtube channel - ‘Star Wars News and Views’ - as well as a facebook page for the video channel too. and these superb and informative OriginalTrilogy•com threads, here - Complete Comparison of Special Edition Visual Changes, Sources on the Special Edition and Modern SE Revisionism - all painstakingly compiled by the multi-talented doubleofive - a much valued member & contributor to this site. 10th March - The OT•com officially comes online (skynet style 😉) - the site petition gains traction and will eventually reach 72,000+ signatures; leading and spearheading fan pressure campaigns at the time… culminating in a 2006 release of the theatrical versions of the Original Trilogy on DVD - albeit as bonus discs on a ‘Special Edition’ DVD set (see 2006 for more info). across 2003 - Lucasfilm Animation is founded. 14th April - sees the video of ‘The Star Wars Kid’ uploaded to the internet. 14th May - ‘Jedi: Shaak Ti’, the second issue in the ‘Star Wars: Jedi’ series of comics, is released. 26th June - Star Wars Galaxies: An Empire Divided is released for the PC. 17th July - Knights Of The Republic (KOTOR) is released for the XBox. September - ‘Episode III – Revenge of the Sith’ starts production. 20th October - Rogue Squadron III: Rebel Strike is released for the Nintendo Gamecube. 7th November - Star Wars: Clone Wars (Tartakovsky’s animated Clone Wars series) is aired on US tv. 19th November - sees the last ‘Star Wars: The New Jedi Order’ (aka NJO) book in the series released. 30th December - ‘Tatooine Ghost’ post-ROTJ paperback - the 1st EU novel to bridge the gap between PT & OT characters. 31st December - The OriginalTrilogy•com petition reaches over 47,500 signatures. 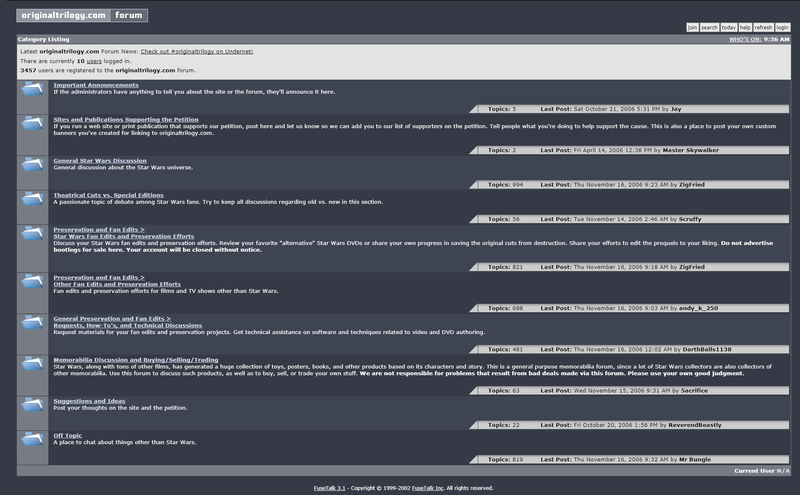 Originally, the forum on here was quite a basic and concise affair - mainly for ideas and suggestions from fellow fans who wished to contribute someway to the cause of the petition’s goals, and for also cataloging and finding other sites and publications who may been affable or sympathetic to join and further strengthen the fan pressure on Lucafilm. 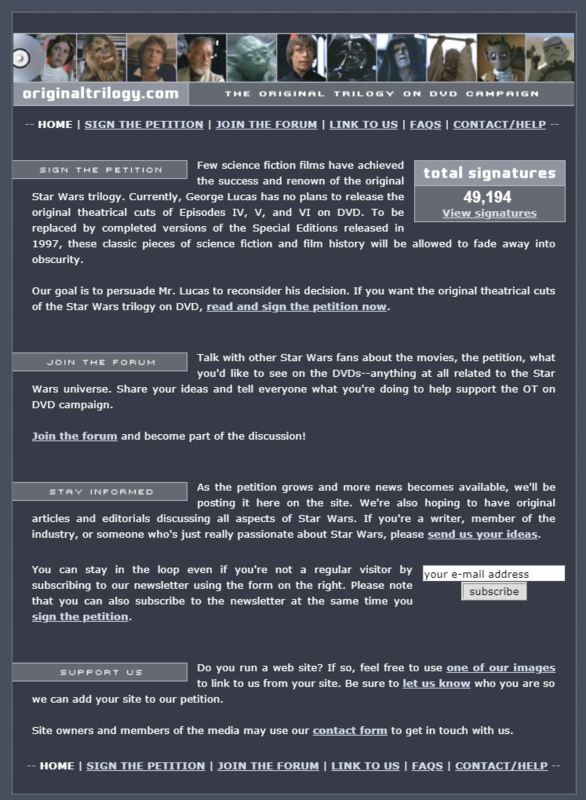 There was also an ‘Announcements’ section for site/petition news, a ‘Theatrical Cuts vs. Special Editions’ section for fans to learn about the many changes made to the OT films, a ‘General Star Wars Discussion’ section, and an ‘Off Topic’ section for anything else not covered by the other categories. In little over a year, the OT•com forum had become a hive of scum and villainy dedicated members who had grown into a community interested in putting together and viewing our own fan-made preservation projects based on previous Original Trilogy releases - in the form of various laserdisc-to-dvd transfers - in a new and dedicated ‘Original Trilogy Preservation’ section of the forum. Skills, techniques, information, advice, stories, successes & failures, as well as answers to many questions & unknowns - all shared and experienced through the community on here, which had naturally evolved alongside the forum’s original premise - something which still remains true over 15 years later, on this, the most resolute and adaptable of places. Well in, Jay. And also to every petition signee & every OT•com member who has contributed anything, something, on here too. across 2004 - Rikter & others highlight the Dr Gonzo and Cowclops/TR47 sets of the laserdisc captures to dvd format for the Original Trilogy. Editdroid, ISOMIX, Farsight, Moth3r’s PAL version, Zion - X0, Laserman - X0, Citizen, Grinder, Doctor M, OCP/Dark Jedi, Dark/Sega, Wookie Groomer, Puggo, MoveAlong, Arnie.d, tellan, msycamore, LeeThorogood, althor1138, MeBeJedi, RowMan, PaulisDead2221, ocpmovie, babyhum, DarthEditous, and many, many other editions all soon follow in the next few years. across 2004 - MagnoliaFan releases his Episode I & II Prequel Edits, as well as a pre-ANH version. 1st May - Hal 9000’s ‘The Phantom Edit’ thread - on probably the 1st mainstream Star Wars fan edit. 20th June - Rikter’s ‘Star Wars - The Edits and DVDr releases thread’ archive. September see the first full release of the Original Trilogy on DVD. Unfortunately it does not carry the unaltered theatrical version of the OT. More info - link. 21st September - Molly’s 'Using the ‘04 version to restore teh original’ - '04 OT DVD release to bring about an OOT version project. 30th September - The MeBeJedi feedback thread. 30th September - ocpmovie’s Star Wars: Deleted Magic documentary. 3rd October - The “ISOMIX” feedback thread. 4th October - Zion’s ‘The Zion DVD Project’ thread. 15th October - The “Farsight” Trilogy DVD Info and Feedback Thread. 16th October - grisan’s ‘Star Wars OT ANH - PAL Laserdisc transfer’ preseveration project. 19th October - khamul02’s ‘The Odyssey Collection’ - ‘Faces Set’ laserdisc to dvd project. 20th October - mverta’s ‘Star Wars Legacy’ project. 25th October - tellan’s ‘The Lancer DVD Project’. 15th November - ADigitalMan’s ‘Thoughts on de-SE’ing the DVD’ ideas thread. 29th November - jwenig’s ‘Troops on Total Movie DVD’ thread. Rikter (and his spookies) had really helped spread the word regarding the existence and availability of two main sets of fan-made Laserdisc to DVD transfers of the Original Trilogy knocking around at this time - those being the ‘TR47 / Cowclops’ and the ‘Dr Gonzo’ versions. These projects inspired many talented, determined or just curious individuals on here to attempt to create their own versions over the next couple of years (and beyond) - PAL or NTSC, through differing quality laserdiscs players, from the various OT laserdisc releases - with some DVD sets even having their own customised menus or bonus features! These newly created projects were sent to the four corners of the world and beyond - by some of the community on here - creating free Pay-It-Forward (PIF) networks of snail-mailing DVD discs through the post. This was at a time when dial-up internet was still prevalent for many, few computers had dvd re-writers - yet had meagerly sized hard drives, and also a lack of online storage services for dvd files as large as 4gb or so - let alone the 12-13gb required for the three Original Trilogy films. Obviously, 2004 also saw the first release of the Original Trilogy on DVD - yet these would be the ‘Special Editions’ only - with more changes made to them since the 1997 SE release - and no sign of the unaltered theatrical versions. 3rd January - Laserman’s ‘The X0 Project Discussion Thread’ project. 13th January - Zion becomes part of the OT•com moderation team. 18th January - The “EditDroid” Trilogy DVD Info and Feedback Thread. 4th February - Greetings from Wookie Groomer; Split Screen News. 13th February - The Official babyhum Release Thread. 20th March - Trooperman’s ‘Episode II: Shroud of the Dark Side (the TM edit)’ fan edit. 28th April - SKot’s Preserving the…cringe…Star Wars Holiday Special project. 19th May - Episode III : Revenge Of The Sith is released (US date). 19th May Star Wars: Classic Edition by Ocpmovie. 5th June - ADigitalMan’s ‘non-Star Wars DVD Info Projects and Feedback’ Thread. 8th June - Citizen’s NTSC DVD / PAL DVD / XviD project. 26th June - Hal 9000 starts work on his Prequel Trilogy Edits. 2nd August - Dr. M’s Reinventing The Wheel Edition (PAL to NTSC+). 3rd August - Rikter’s ‘The Official ANGRYSVN STAR WARS Release Thread’ project. 3rd August - DigitalFreakNYC’s Projects Release Thread. 8th August - The Official RowMan Release Thread. 3rd September - segaflip’s ‘The Official Dark/Sega Special Collection*** Release Thread’. 19th September - JackLucas’ 'Does Anyone Have The Old Original Theater Bootleg ‘77 Tape?’ thread. 26th September - Classic Edition: The Empire Strikes Back by Ocpmovie. 27th October - Zion’s ‘The XØ Project - Laserdisc on Steroids’ project. 14th December - The Moth3r PAL DVD Set Info and Feedback Thread. 25th December - Grinder’s PAL widescreen project. 29th December - Classic Edition: Return of the Jedi by Ocpmovie. across 2005 - ADigitalMan releases his Star Wars Saga Edit releases. across 2005 - JambeDavdar’s first of his OT Filmumentaries - ‘Building Empire’. 2005 saw the release of ‘Episode III: Revenge Of The Sith’ in the cinema - and later in the year on DVD; with therein work commencing on an array of Prequel Trilogy Fan Edits, ‘3-in-1’ PT projects, ROTS edits, and ‘Complete Saga’ fan projects to come. Fans had been inspired and curious for some time by ‘The Phantom Edit’ released back in 2000/2001 on VHS - and given the general unhappiness with the quality of the Prequel Trilogy… many took to editing and making their own versions (or ‘Special Editions’) of the Prequels. Some Edits were fairly light with changes - whilst other Edits featured heavier alterations - new alien subtitles and scripts altering the story, re-colouring of scenes (and even lightsabers), insertions of deleted scenes or bonus materials, actors’ voices and scenes from other bodies of work were inserted, cuts were made for pace and timing - along with some Edits near-on removing entire characters from the original story. The year also saw OT•com member Jambe Davdar commence work on his superb Filmumentaries OT project - fan-made, yet professional quality documentaries; starting with ‘Building Empire’ (and would later go on to release ‘Returning To Jedi’, and finally ‘Star Wars Begins’. 4th January - Jambe Davdar’s ‘Returning To Jedi’ OT filmumentary. 17th January - daveytod’s ‘The Clones Revealed’ Episode II: AOTC fan edit. 25th January - Moth3r becomes part of the OT•com moderation team. 29th January - jasonrocksout’s ‘Song Of The South’ non-SW project. 8th February - Byakko’s ‘X-Men: the animated series (1992-1997)’ non-SW project. 12th March - Doctor M’s ‘The Matrix Hacked’ non-SW fan edit. 14th March - marioxb’s ‘Backstroke of the West with retail DVD quality’ fan edit thread. 18th March - marioxb’s ‘Little Shop of Horrors original ending’ non-SW project. 28th March - MoveAlong’s - The Story of Star Wars. 27th April - Darth Editous’ ‘Episode V DVD Info and Feedback Thread - a work in progress’. 7th May - spaint’s ‘Giorgio Moroder’s Metropolis’ non-SW project. 8th May - ReverendBeastly’s ‘Criterion Collection: Adventures of Baron Munchausen & The Fisher King’ non-SW project. 20th May - Moth3r’s ‘My Summer With Des - VHS preservation’ non_SW project. 5th July - Spence101287’s ‘Young Indiana Jones…’ non-SW project. 19th July - adywan starts work on his Revisited Edition of Star Wars (as past of his OT Edits). 12th September - The theatrical versions of the Original Trilogy are released on DVD - albeit on bonus discs as part of another Special Edition release set - in a substandard non-anamorphic format; even for 2006. 16th October - The Puggo Edition - webpage and screenshots project. 24th October - InfoDroid’s ‘Star Wars: REBORN - The Complete Saga’. 19th November - Moth3r’s Pre-ANH bootleg telecine - a widescreen version project. 1st December - GhostAlpha26’s ‘PT as one movie’ fan edit. Then came the news that coming unaltered theatrical version release would be in letterbox format - and not Anamorphic widescreen. Followed by the reveal that the transfer would be from the 1993 Definitive Edition Laserdiscs - a 13 year old and, even then (in 2006), substandard quality - before using compressed sound and adding DVNR to reduce the picture quality and detail futher. Lucasfilm stated that they ‘…could not put the extraordinary time and resources into this project as we did with the Special Editions. The 1993 Laserdisc masters represented the best source for providing the original versions’. More detailed info on the 2006 OT DVD release can be found at the SaveStarWars•com website, here - link, and also in the An Index Thread for General Star Wars Discussion… - in ‘Archival / Historical discussions’ section. 4th January - Moth3r’s The Mono Mix Restoration Project. 5th January - RIJIR’s ‘Is anyone doing a “Virtual” Lost Cut?’ thread. 20th January - Jambe Davdar’s ‘Star Wars Begins’ OT filmumentary. 12th February - Jonno’s ‘Alien Appendix #3: The Alien Archive’ non-SW project. 27th February - musicman’s ‘Two-Face (A Batman: The Animated Series Movie)’ non-SW fan edit. 5th March - GoodMusician’s Star Wars Prequels/Original Trilogy: The Complete Scores project. 9th March - ‘Wookie Groomer Presents: ADDICTED TO STAR WARS’ thread. 12th March - PaulisDead2221’s ‘The Empire Strikes Back - The Vintage Edit’ project. 6th April - ThatArtGuy’s ‘The Spinal Tap Omnibus - Volume 6: The 1992 Concert Tour’ non-SW project. 30th April - wainsco’s ‘1997 SE TB Digital Broadcasts’ thread. 27th May - PaulisDead2221’s ‘Star Wars - The Vintage Edit’ project. 12th June - Pat-Fett’s ‘30th Anniversary DVD Idea’ thread. 12th June - FanFiltration’s ‘Star Trek: The Motion Picture (Special Longer Version)’ non-SW project. 27th June - Wookie Groomer’s 1080p Star Wars Saga project. 9th July - Doctor M’s ‘Harry Potter and the Chamber of Secrets - The Enhanced ABC Cut’ non-SW project. 13th July - reave’s ‘Transformers The Movie: Resparked’ non-SW fan edit. 14th August - ThrowgnCpr’s ‘The Harry Potter Archives’ non-SW fan edit. 25th November - Lord Phillock’s ‘The Fellowship of the Ring - The Book-Cut - v2’ non-SW fan edit. 29th November - Bob’s ‘The Star Wars Holiday Special De-Campified’ project. By 2007 the OT•com had already seen many preservation, fan edit and fan projects for Star Wars material in it’s short time - yet was also now seeing many edits and preservations for non Star Wars material too. From films, documentaries and tv series, and audio and soundtrack projects as well. From popular classics to long-forgotten gems, out-of-print or previously thought-lost material, bonus materials and deleted scenes being more available than before, and also giving some new life to content that hadn’t been seen or released in certain countries before. All the while Editors were honing and also sharing their skills, experiences, info and advice, with more techniques being catalogued, new software being released - along with advances in technology making it slightly easier and cheaper to accomplish many highly polished fan-made releases. 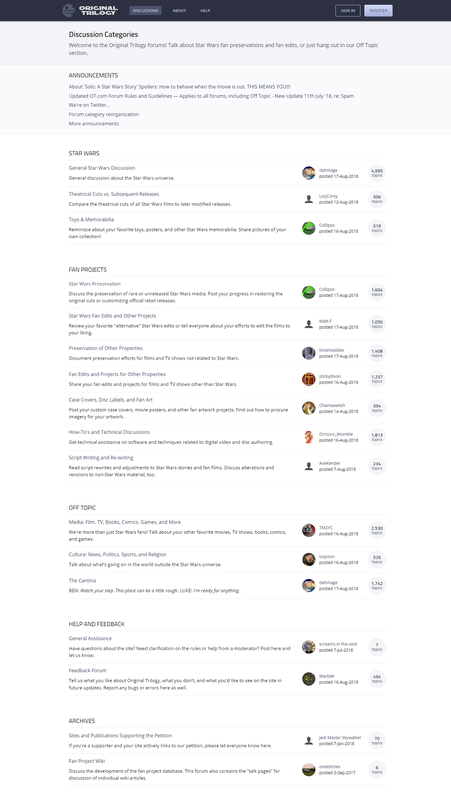 With this growing popularity of fan-made projects, Jay launched a ‘sister site’ to the OT•com - FanEdits.com - a wiki-style fan project database with the goal of featuring the various film ventures being produced by fans. 10th January - JasonN’s ‘The Matrix Evolutions’ non-SW fan edit. 12th January - klokwerk’s ‘The Keep - Satellite Rip’ non-SW project. 20th January - Molly’s ‘The Vaultbreakers Collection - Disney Preservations’ non-SW project. 12th February - focuspuller’s ‘Blade Runner: The Complete Music Collection’ non-SW project. 15th February - adywan’s ‘Empire Strikes Back’ Revisited Edit. 27th February - Galactus’ ‘Star Wars: Bounty Hunter - Beyond The Game 2.0’ - with MoveAlong + ThrowgnCpr project. 25th April - Rock Savage’s ‘V For Vendetta: The Fan Edit’ non-SW fan edit. 2nd May - djsmokingjam’s ‘The Evil Dead Treasures Collection’ non-SW project. 24th-28th May_ - Zion’s ‘Star Wars CELEBRATION IV in Los Angeles - May 24-28 2007’ 30th Anniversary Convention thread. 5th June - InfoDroid’s Indiana Jones and the Temple of Doom non-SW fan edit. 11th July - JasonN’s ‘Shadows Of The Old Republic’ (3-in-1 Prequel Film). 10th August - The Clone Wars animated film premieres at US cinemas. 17th August - Asteroid-Man’s ‘Star Wars: Renascent’ project. 11st September - Puggo - Jar Jar’s Yoda’s ‘Puggo GRANDE - 16mm restoration’ OT project. 3rd October - The Clone Wars animated tv series is aired on US tv. 22nd October - TMBTM’s ‘Star Wars Saga: Silent Film Edition’ project. 4th November - sees another re-release of the Original Trilogy in a DVD boxset - still with no unaltered Theatrical Versions of the Original Trilogy (a Prequel Trilogy boxset is also released too). More info here - link. 8th November - Bingowings’ ‘The Prequel Radical Redux Ideas Thread’. 2008 saw the highly anticipated release of adywan’s 'Revisited Edition’ of Star Wars. Inspired by watching the ‘ADigitalMan / Darth Editous Hybrid’ Fan Edit of Star Wars, adywan had started off simply colour-correcting the official Specials Edition DVD release. As he progressed he found that there were many things he could figure out how to do to make what he felt the Special Editions could - and likely should - have been; resulting in new scenes being filmed and added, a new sound mix, effects, music, and hundreds of small tweaks and edits made. Another OT•com member also had a busy year… zombie84 released his book ‘A Secret History of Star Wars’ to critical acclaim and high praise. The detailed and thorough book (containing over 400 sources and filled with quotes from people such as George Lucas, Gary Kurtz and Mark Hamill) challenged many myths, legends and revisionism surrounding the origins of the series - and placed the films, both in their inception and history, as well as what had become oft-repeated ‘lore’, in a new factual light. 21st February - Troy’s ‘What Ever Happened To PAY IT FORWARD System? (PIF)’ thread. 17th March - teharri’s ‘Star Wars: Fan Trailers’ project. 28th March - ABC’s ‘THE OT SOUNDTRACKS SALVAGE - SW ESB ROTJ - “remastered”’ project. 20th May - GoodMusician’s ‘Episode III Re-Edit’ project. 30th June - dark_jedi’s ‘Star Wars OT & 1997 Special Edition Info’ archive. 22nd July - DuTwan’s ‘Voice Actors for Fan Edits and Re-dubs Thread’ thread. 25th July - Jonno’s ‘Alien Appendix #4: The ALIENS Archive’ non-SW project. 1st August - fishmanlee’s ‘Yellow Harvest (ROTJ Fan Edit)’ thread. 8th August - arnie.d’s The X9 Project. 9th August - Funcha’s ‘A new edit of Empire Strikes Back’ project. 12th August - TheBoost’s ‘Worst Edit Ideas’ thread. 31st August - tb1971’s ‘Alien Appendix #5+6: The ALIEN SAGA Archive’ non-SW project. 26th September - Kevinicus’ ‘Transformers: Reformatted (2007)’ non-SW fan edit. 6th October - Moth3r’s ‘Project Index: Star Wars Fan Edits’ archive index thread. 12th October - ABC’s ‘Re-Scoring The Empire Strikes Back - The 1980 Film Version Edit’ project. 20th October - rpvee’s ‘My Revenge of the Sith Trailer’ project. 11th December - TheBoost’s ‘Dracula (1931) - The Transfusion Edit’ non-SW fan edit. December - OriginalTrilogy•com’s twitter account is started. 31st January - JasonN’s PT FanEdits (Attack of the Federation, Twilight of the Republic, & The Black Knight Rises). For a couple of years prior, news of a documentary being made which would include fans’ own opinions on Star Wars had piqued much interest amongst SW fandom. The ‘People Vs George Lucas’ is an examination of the widespread fan disenchantment with George Lucas at the time; the lack of an acceptable quality release of the theatrical versions of the OT, as well as disappointment with aspects of the Prequel Trilogy - the changing of the mythology - as well as the story itself. 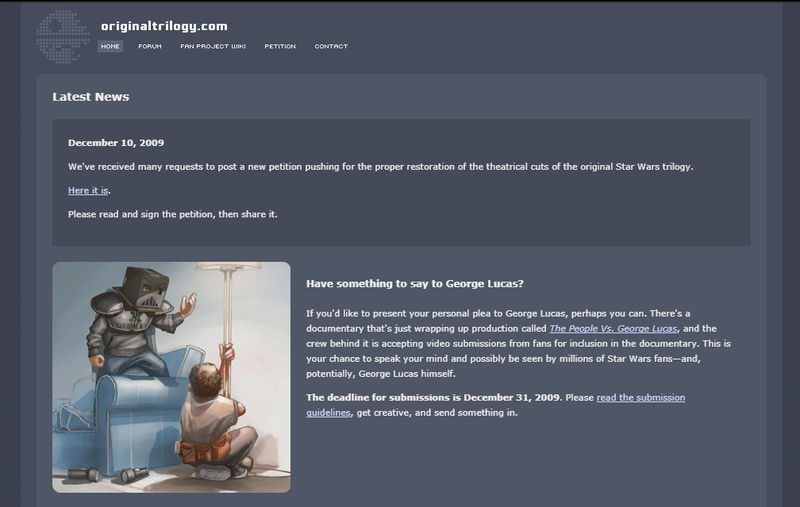 The director of the ‘People vs George Lucas’ documentary invited fans from here to contribute to it, and 2009 saw the cut-off point for applications as the film would be released early 2010. Members of the OT•com feature in the documentary and some of their thoughts (and others) can be found in the subject’s discussion thread, here - link. ABC’s (and seventiesfilmnut’s) project to salvage and remaster the Original Trilogy Soundtracks - from changes made to them over the years by the releases of the Special Editions soundtracks (and restoring the original dynamic sound, warmth and depth back to them) - was released this year. across 2010 - hairy_hen starts work on the 1977 70mm sound mix recreation project. 8th January - ThomasJarvis’s ‘Phantasm: Ultimate Extended Edition’ non-SW fan edit. 10th March - helmetcrow’s ‘New Star Wars Edit’ remix project. 19th March - bobgarcia74’s ‘SW Episode III - Reign of the Dark Side’ fan edit. 20th March - hairy_hen’s ‘Star Wars 1977 70mm sound mix recreation’ - 5.1 & stereo available project. 17th April - tb1971’s ‘Alien Appendix #7: The ALIEN SAGA Archive’ non-SW project. 30th May - Nicholas J. Michalak’s ‘Star Wars Prequels: The NJM Edits’ thread. 7th July - The Cutter’s ‘Revenge Of The Cut - Fan edit of Star Wars Revenge Of The Sith’ fan edit. 12th July - none’s ‘Star Wars - The Ultimate Experience - Is Forever …One Last Time (Television Trilogy Preservation Set + SW Commercial Breaks)’ thread. 20th July - captainsolo’s ‘Hard Boiled and The Killer’ non-SW project. 23rd July - msycamore’s ‘THX 1138 “preservations”’ non-SW project. 15th August - LeeThorogood’s PAL LaserDisc Preservation Project. 13th September - doubleofive’s ‘Complete Comparison of Special Edition Visual Changes’ project. 26th September - See No Evil’s ‘Book Of The Dead AKA The Evil Dead - Preservation’ non-SW project. 26th September - satanika’s ‘Nezha Conquers the Dragon King (1979)’ non-SW project. 30th September - muddyknees2000’s ‘ANH…Revisited or Purist?? ?’ adywan edits conversation thread. 6th October - Moth3r’s ‘Project Index: Star Wars Fan Edits’ archive for Star Wars fan edits. 25th October - nightstalkerpoet’s ‘Episode 1: The Phantom Hour’ fan edit. 20th November - none’s Theater Performance Preservations archive. Two years on from the release of his informative book (A Secret History Of Star Wars), zombie84 started the SaveStarWars•com website - a comprehensive journal chronicling many intriguing articles and editorials as well as news and information from the time - and proves to be a great resource for anyone interested in the evolving changes made to the Original Trilogy. The website can be found here, and his OT•com discussion thread on the website can be found here. doubleofive’s ‘Complete Comparison of Special Edition Visual Changes’ quality project thread (here) - made for a superb contribution to the site - listing all of the numerous and continuing changes made to the Original Trilogy over time. His later twitter page and blog page also archive those changes on differing media platforms and well worth visiting to see just how many have occurred since the 1997 ‘Special Editions’. hairy_hen’s ‘Star Wars 1977 70mm sound mix recreation’ project also came to be in 2010; providing a release that had not been previously made available on home video - as well as fulfilling the stated goal of trying to sound as much like the original mix as possible. 22nd January - doubleofive’s ‘Modern SE Revisionism’ thread. 22nd January - Brash’s Star Wars Sound Effects Archive - A collection of the best Star Wars sounds for use in Fan Editing project. 7th February - TV’s Frink ‘Episode I: The Ridiculous Menace’ project - part of Frink’s Ridiculous SW Saga releases. 23rd February - Puggo - Jar Jar’s Yoda’s ‘Puggo Strikes Back!’ 16mm project commences. 7th March - SpenceEdit’s ‘Duel of the Fates’ project. 15th March - none’s ‘Treadwell Collection’ VHS archive project. 5th April - Harmy’s Despecialized Editions of the Original Trilogy - Star Wars. 7th April - Harmy’s ‘STAR WARS TRILOGY - The Very Special Edition (Feature length parody compilation)’ project. 17th April - Harmy’s Despecialized Editions of the Original Trilogy - Empire Strikes Back. 18th May - none’s ‘FLIMSIPLAST DATABASE’ archive project. 18th May - doubleofive’s ‘Sources on the Special Edition’ project. 6th June - Harmy’s Despecialized Editions of the Original Trilogy - Return Of The Jedi. 5th September - Anchorhead becomes part of the OT•com moderation team. 7th September - dark_jedi’s ‘Conan The Barbarian 1982 US Theatrical Edition’ non-SW project. 11th September - SilverWook becomes part of the OT•com moderation team. 12th September - mysycamore’s ‘STAR WARS - Special Widescreen Edition (Technidisc)’ project. 16th September - sees the release of the ‘Star Wars: The Complete Saga’ on blu ray - with more changes made to the films. More info can be found here - link. 25th September - pittrek’s “The Ewoks Project” DVD set’ project. 17th October - Joshua_Blue’s ‘ANH:R - Stronger Vader edit’ thread. 31st December - fishmanlee’s ‘The Star Wars Movie Score Unused/Replaced Music Restoration Thread’ project. The Original Trilogy had it’s first blu ray release in 2011 - featuring yet more changes to the Original Trilogy - though did not feature a release of the theatrical versions of the films. However, Harmy’s ‘Despecialized Edition’ of the Original Trilogy came to the fore that year - providing a fan-made 720p HD quality restoration of the theatrical versions first three films - sourced mainly from the official blu ray release themselves (along with a few other elements). A tireless and exhaustive task - made a little easier by the community here collaborating with Harmy to help him come up with a professional-level release - that for many fans surpassed any of the official home video releases of Star Wars, previous. Harmy had no prior professional experience with film editing - and taught himself as the venture progressed, beginning with some Photoshop skills that he had developed in college. To remove the post-theatrical version changes he painstakingly went through the films frame-by-frame, correcting colours and rotoscoping scenes - undoing some shots took only an hour, while others took hundreds. Lightsabers were color-corrected, and CGI characters & backgrounds were removed. Harmy then edited these sources together using software such as Adobe After Effects and Avisynth. 2nd January - JawsTDS’s ‘Jaws the Revenge: Off the Cutting Room Floor Preservation’ non-SW project. 25th January - Puggo - Jar Jar’s Yoda’s ‘Return of the Pug (ROTP)’ 16mm project starts. 28th February - thunderclap’s (aka Q2) ‘The Fall of the Jedi Trilogy’ Prequel Edits. 4th March - retartedted’s ‘Droids Series Complete Set’. Reconstruction from multiple sources project. 7th March - Octorox’s ‘Topher Grace’s prequel edit’ thread. 20th June - AntcuFaalb’s ‘Pre-ANH Star Wars Bootleg VHS from 1978’ project. 28th June - Brooks’s ‘Adventures in VHS preservations’ project. 19th July - none’s ‘International Audio (including Voice-Over Translations)’ project. 15th August - schorman13’s Star Wars Laser Disc Audio Archive. 2nd September - Team Negative 1’s 35mm theatrical version projects for the OT start. 1st November - Emanswfan’s Prequel Trilogy fan edits. 11th November - You_Too’s ‘Our Night Of The Living Dead 1990’ non-SW project. 25th November - arctofire’s ‘Do you think Disney will release the unaltered versions for DVD and blue ray’ thread. 15th December - Molly’s ‘ROBOTECH: The Deculture Collection’ non-SW project. 21st December - Disney buys Lucasfilm, the company behind the Star Wars films - from its chairman and founder George Lucas, for $4.05bn. 25th December - emanswfan’s ‘Star Wars Prequels 35mm 4K Filmized Editions’ project. 27th December - none’s ‘AARRSSTW - WTSSRRAA’ Special Edition made ‘Specialer’ project. across 2012 - Catbus starts work on Project Threepio - Star Wars OOT subtitles. Disney buys Lucasfilm. During a meeting that George Lucas had with Disney CEO Bob Iger, Lucas told Iger he was considering retirement and planned to sell the company, as well as the Star Wars franchise. On October 30, 2012, Disney announced a deal to acquire Lucasfilm for $4.05 billion, with approximately half in cash and half in shares of Disney stock. Kathleen Kennedy became president of Lucasfilm, with George Lucas originally announced as serving as creative consultant. On December 21, 2012, Disney completed the acquisition and Lucasfilm became a wholly owned subsidiary of Disney. The company also announced the future release of new Star Wars films, starting with Star Wars: Episode VII – The Force Awakens, in 2015 - part of the new Star Wars Sequel Trilogy. Catbus’ superb ‘Project Threepio’ (Star Wars OOT subtitles) project was released in 2012. The venture’s aim is to ‘provide high-quality subtitle options for preservations of the Star Wars “Original Original Trilogy” – Star Wars, The Empire Strikes Back, and Return of the Jedi in their unaltered forms – and to provide a framework with which anyone can add or change subtitles as needed for any other purpose. I hope that this will broaden the appeal of our preservation efforts beyond the English-speaking world’. 18th March - althor1138’s ‘Star Wars Laserdisc Preservations’ archive. 3rd April - Lucasfilm confirmed that LucasArts ceases to operate as a video game developer. Future video games based on its properties will either be developed by Disney Interactive Studios or licensed to third-party developers. 26th April - ^…^'s ‘Jurassic Park’ non-SW project. 7th May - TM2YC’s The Star Wars: The Lost Workprint project. 18th May - njvc’s ‘Pulp Empire’ fan edit project. 20th May - Lucasfilm announces Star Wars Rebels - an animated TV series for 2014. 20th June - kk650’s Star Wars Saga: Regraded and Semi-Specialized project. 20th June - kk650’s Miscellaneous Regraded Films projects. 26th June - Hal 9000’s ‘Star Wars Episode I: Cloak Of Deception’ Prequel Edit project. 15th July - dark_jedi’s ‘Fright Night Part II 1988’ non-SW project. 17th July - Hal 9000’s ‘Star Wars Episode II: The Approaching Storm’ Prequel Edit project. 20th August - Bladez636’s ‘Star Fleet/X-Bomber (1980) Remastered Edition’ non-SW project. 20th September - Laserschwert’s ‘Krieg der Sterne - Despecialized Edition 2.7 (German)’ OT project starts. 21st September - Tasjo’s ‘Holiday Special WHIO 1st Gen VHS Preservation’ project. 8th October - sees the release of the ‘Star Wars: The Complete Saga’ on blu ray and dvd box sets again - still no unaltered Original Trilogy versions. More info can be found here - link. 11th October - Matt_Stevens’ ‘Crocodile Dundee - 1080p video plus Uncompressed audio from Laserdisc’ non-SW project. 18th October - dark_jedi’s ‘released projects’ thread. 30th October - ^…^'s [spoRv] projects - past and future. 3rd November - ^…^'s ‘Haloween’ non-SW project. 3rd November - ^…^'s ‘Disney’s Beauty and the Beast’ non-SW project. Disney boss Bob Iger confirms that Lucasfilm plans to have stand-alone Star Wars films, with Lawrence Kasdan and Simon Kinberg lined up to develop the movies, that would be released sometime during the six-year period the then-coming Sequel Trilogy will be released - link. 1st January - NeverarGreat’s ‘A New Hope Technicolor Recreation’ project. 1st January - Darth Lucas’ ‘The Star Wars Mono-logy’ project. 26th January - docsap’s ‘The Abyss - Special Edition (1989) BluRay Project’ non-SW project. 14th February - 13las’ ‘Radical Attack of the Clones Edit’ fan edit & ideas thread. 25th February - Hal 9000’s ‘Star Wars Episode III: Labyrinth Of Evil’ Prequel Edit project. 10th March - marioxb’s ‘It’s the full collection, Charlie Brown! AKA continuing the Warner Peanuts 1960s, 1970s “decade” collections’ non-SW project. 21st April - csd79’s ‘Star Wars SWE LD preservation’ 1993 Technidisc preservation project. 25th April - Lucasfilm announces the end of the Star Wars Expanded Universe. 29th May - schorman13’s HDTV Star Wars Saga Preservation project. 6th June - Flanders of Iowa’s ‘Star Wars: Rendezvous at Kazook. (SWHS meets Episode II)’ project. 24th June - jimbotron235’s ‘Amadeus - Theatrical Cut Restoration 1080p’ non-SW project. 8th July - Jetrell Fo’s ‘Alien DC Project’ preservation. 12th July - jerryshadoe’s ‘Last of the Mohicans - Original Theatrical Cut’ non-SW project. 14th July - danny_boy’s 4K restoration on Star Wars discussion thread. 26th July - dvdmike’s ‘Slipstream 1989’ non_SW project. 24th September - PDB’s ‘Blade Runner Color Regrade’ non-SW project. 11th December - RU.08’s TPM 1080p Theatrical Preservation project. 17th December - smudger9’s ‘Clone Wars Movie Series’ Edit project. 20th December - dark_jedi’s ‘Terminator 1 & 2 Projects’ non-SW project. Disney’s Lucasfilm announced it had dissolved the Expanded Universe (aka EU) permanently - and Lucasfilm would have local Governors would have direct control over these territories to keep it all in line - or possibly something about ‘Canon’ & ‘Legends’, who knows? 😉 The OT•com discussion thread on this decision, with honourable mentions to why fans’ own personal canon can be just as relevant and important, along with various other thoughts and comments, can be found here - link. 2014 also saw the US premiere of the animated tv series Rebels - which would go on to run for four seasons. Rebels was set five years before the events of Star Wars '77, and tells the story of the Rebellion’s beginnings while the Empire spreads tyranny through the galaxy. Though not ‘year specific’ to this timeline thread… I’d just like to highlight some of the great work done by many of the talented individuals on here who made dvd and blu ray covers, inserts, disc-art, boxsets, other media device covers, and fan art in general on the OT•com - in the site’s ‘Case Covers, Disc Labels, and Fan Art’ section. Also kudos to those who’ve supplied info and resources, advice and help on how best to print these works of art - and also to further improve the quality of sets available - whether from the official Star Wars releases - to the numerous fan edits, preservations and fan projects on here - and to non-Star Wars content as well. 1st January - Marduk666’s ‘Return of the Sith – Revenge of the Jedi’ fan edit. 16th January - CSchmidlapp’s ‘The Dark Knight Trilogy - Theatrical Preservation’ non-SW project. 20th January - eldusto84’s ‘JRR Tolkien’s The Hobbit: turning a mediocre trilogy into one really good film’ non-SW fan edit. 23rd April - ^…^'s Star Wars: SDTV & HDTV digital broadcast database archive. 24th May - Ziggyonice’s ‘Episode VI: Return of the Jedi — The ‘Ziggy’ Edit’ fan edit. 1st June - poita’s ‘Fantasia’ non-SW project. 7th June - GoboFraggle1983’s ‘The Smurfs and the Magic Flute - United States English Dub from 1983’ non-SW project. 14th July - mredthefed’s ‘Heavy Star Wars Prequel Trilogy - Heavy Metal Style Fan edit’. 18th July - peter_pan’s ‘Red Dwarf Night: 10th Anniversary’ non-SW project. 21st July - ‘Yotsuya’s Two Saga Edits’ project. 31st July - STENDEC’s ‘Tugs VHS to DVD Preservation’ project. 13th August - DrDre’s ‘Color matching and prediction: color correction tool’ project. 15th August - Disney announces Star Wars-Themed Lands Coming to Walt Disney World and Disneyland Resorts. 13th October - sees the repackaged re-release of ‘Star Wars: The Complete Saga’. Still no unaltered Original Trilogy. More info here - link. 12th November - hundsdorfex’s ‘Need special effects for your edit? Request them here!’ thread. 14th November - swazzy’s ‘The Spongebob Squarepants Movie - 35mm ReCreation’ non-SW project. 29th November - Colek’s ‘Morphine / ??? - 1080p Bluray - The Real Thunderbolt’ non-SW project. 18th December - ‘Episode VII : The Force Awakens’ is released (US date). Episode VII: The Force Awakens was released in 2015, heralding the start of a new Sequel Trilogy from Lucasfilm - without the direct influence of George Lucas. The film harked back to the feeling and vibe of the Original Trilogy - with much emphasis placed on the film using real sets and props over unnecessary overuse of CGI. Even the story - an almost retelling or interpretation from sections of the entire OT paid homage to this - the first Star Wars film in 12 years, and the first investment from new owner’s Disney since their $4b takeover in 2012. Fan reaction was generally positive, though while some found the film ‘to play it safe’ somewhat… many agreed it was an overall improvement on the Prequel Trilogy. DrDre, with a background in image analysis and enhancement, released his Color matching and prediction: color correction tool and also Star Wars GOUT in HD using super resolution algorithm projects in 2012 - just a couple of the many informative and quality projects by the talented and more technical-minded members on here since 2003 - that takes place on the site to help editors and preservationists here learn and achieve even better results for their quality projects. As well as the general help, advice and info offered - and questions answered - by many helpful members in the OT•com’s much-underrated and overlooked ‘How-To’s and Technical Discussions’ section. 25th January - Octorox’s ‘Star Wars: The Phantom Menace - Faster, More Intense!’ project. 14th February - towne’s ‘Harmy’s Despecialized Star Wars 1977 - Color Adjustment Project for v2.7’ project. 25th February - Sheepish’s ‘Star Wars - Shroud of the Sith, a radical fan edit of The Phantom Menace’ fan edit. 6th March - darthrush’s ‘Return of the Jedi - Remastered’ fan edit project. 19th March - Zion’s ‘Star Wars Holiday Special - Zion Hybrid v2’ project. 4th May - poita’s ‘The Original Trilogy restored from 35mm prints’ project. 14th May - Windows7Guy100’s ‘The Blackened Mantle is finally back on YouTube!’ project. 20th May - njvc’s ‘Star Wars Despecialized Editions - Custom Bluray Set’ project. 27th May - Hal 9000’s ‘The Force Awakens: A Gentle Restructure’ fan edit. 26th July - DigMod’s ‘Star Wars: Heir to the Force (TFA)’ fan edit. 13th August - Kenny Baker passes. 25th August - DrDre’s ‘Indiana Jones trilogy regrade, using the 2003 DVDs as a reference’ non-SW project. 13th September - TheHutt’s ‘Stephen King’s IT (1990) - Original two-part version!’ non-SW project. 17th October - Williarob’s ‘Project #4K77’ project thread. 14th November - ^…^'s ‘Star Wars: deleted and extended scenes database’ project. 15h November - ^…^'s ‘Star Wars: audio/video bonus material (home video releases) database’ project. 27th November - ^…^'s Star Wars saga - Extra Extended Edition (1080p) project. 16th December - ‘Rogue One : A Star Wars Story’ is released (US date). 27th December - Carrie Fisher passes. Rogue One, the first of the standalone ‘A Star Wars Story’ films was released in 2016 - to mainly positive reviews and high-grossing takings at the box office. Set at the time of Star Wars '77, the film also featured CGI recreations of the Tarkin and Princess Leia characters - which caused some debate on how ‘good’ (or not) the final compositions were. The film did undergo some much publicised re-shoots - and whilst many enjoyed the released project, it was somewhat disappointing for some that the original and unused footage has not been aired or included as deleted scenes or bonus material (to date). That’s all I’ll put here - as much of this stuff is way beyond my comprehension - though I’d encourage anyone with any interest in seeing a professional quality preservation of the theatrical versions of the Original Trilogy to visit and read poita’s thread above - and also, if they can, to make a donation. across March - Octorox’s ‘Star Wars: Attack of the Clones - ‘Sanded Down’’ fan edit (links to FanRes). 21st January - DrDre’s ‘The theatrical colors of the Star Wars trilogy’ thread. 23rd March - eldusto84’s ‘Rogue One: The Battle of Scarif’ Fan edit. 19th April - NeverarGreat’s ‘The Force Awakens - The Starlight Project’ fan edit. 4th May - Dreamaster’s ‘Denoise, Regrain And CC of ESB Grindhouse’ project. 23rd May - Sir Ridley’s ‘The Force Awakens - Ridley’s Edit’. 22nd June - Octorox’s ‘Star Wars Episode III: Revenge of the Sith, Extended Edition’ fan edit. 14th July - DigMod’s ‘Rise of the Rebellion: A Rogue One Edit’ fan edit. 3rd July - Star Wars : Forces Of Destiny, an animated tv series, airs on Youtube. 20th August - SparkySywer’s ‘A 3-in-1 fanedit of the Star Wars Trilogy (With only one Death Star)’ project. 1st September - adywan’s ‘Return Of The Jedi’ Revisited Edition project. 2nd October - RU.08’s ‘The Phantom Menace on 35mm’ preservation project. 8th October - poita’s ‘1997 Star Wars Special Edition 35mm Project’. 12th October - solkap’s ‘NJVC Custom Bluray Set of Harmy’s Despecialized Editions now available on Mega’ project. 9th November - Lucasfilm announces Rian Johnson will create a brand-new Star Wars trilogy. 17th November - RogueLeader’s ‘Rogue One Edit’ fan edit. 18th December - NeverarGreat’s ‘The Starlight Project Part 2: The Last Jedi’ fan edit. 24th December - DigMod’s ‘Star Wars: Legacy of the Jedi (A The Last JediT)’ fan edit. 29th December - Hal 9000’s ‘The Last Jedi: Legendary’ fan edit. 2017 also saw adywan being work on final part of his OT Revisited Editions - Return Of The Jedi. Given the outstanding and meticulous labour of love undertaken by him on the previous two OT films we wish him all the good fortune that can come his way - and also hope for a smooth experience in completing his highly rated and much-anticipated finale to the Trilogy. 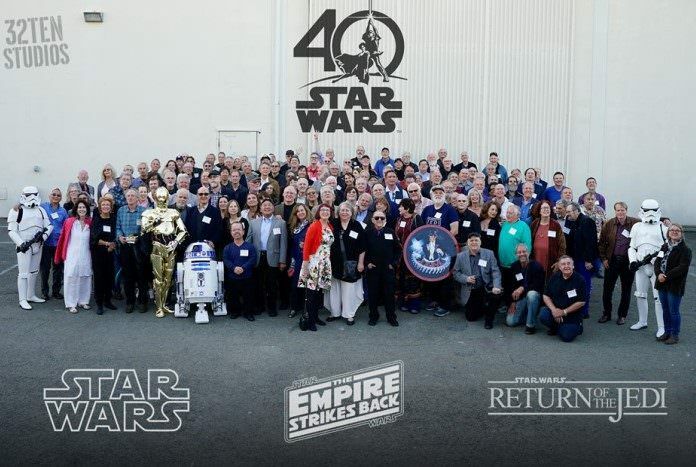 Though not specific to this year… colossal thanks, respect and kudos to the tremendous efforts by some members on here to bring us all the various Star Wars news & information since 2003 (and / or archiving it), as well as helping with fellow members’ queries - seeking out info and providing answers to them. To members such as ADigitalMan, adywan, alexp120, althor1138, Anchorhead, ATMachine, Bingowings, Bossk, Bluto, canofhumdingers, Captain_Danielsan, Catbus, ChainsawAsh, crissrudd4554, CO, coov, dark_jedi, Darth Chaltab, Darth Editous, darth_ender, digitalfreaknyc, Doctor M, DominicCobb, doubleofive, DrDre, emanswfan, EyeShotFirst, Fang Zei, fishmanlee, hairy_hen, HanDuet, Jay, JennyS1138, Jetrell Fo, Jonno, Laserman, Laserschwert, Luke Skywalker, Mavimao, MeBeJedi, Mielr, Molly, Moth3r, motti_soL, moviefreakedmind, Nanner Split, Neil S. Bulk, NeverarGreat, njvc, none, one69chev, Octorox, paja, phildesfr, poita, Puggo - Jar Jar’s Yoda, RRS-1980, ricarleite, Rikter, Ripplin, russs15, RU.08, schorman13, screams in the void, sean wookie, SKot, SilverWook, solkap, spoRv, Tobar, TM2YC, towne32, Video Collector, Williarob, yhwx, Yoda Is Your Father, yotsuya, Z6PO, ZigZig, Zion, & zombie84 - as well as the countless other members I’ve already forgotten to mention in here (and for which I profusely apologise). Also many positive waves to every other member of the community here who contribute bits and pieces of SW content, insights, advice, help, encouragement, funny anecdotes & more - all sharing experiences - and ‘just’ being part of the resolute ‘Rebel Scum’ which makes up the Alliance that is this unique site. 9th January - darth_ender’s ‘Star Wars: The Lost Cut’ project. 21st January - krlozdac’s ‘Rogue One: A Star Wars Story - Stardust Edition’ fan edit. 4th February - OutboundFlight’s ‘Vader - a 7 in 1 edit of the Star Wars Saga’ fan edit. 6th February - Lucasfilm announce Game Of Thrones’ David Benioff and D.B. Weiss are going to write and produce a new series of Star Wars films. 18th February - OutboundFlight’s ‘Maul: Son of Dathomir’ - a Clone Wars based fan edit. 8th March - Lucasfilm announces that Jon Favreau is going to produce and write a live-action Star Wars tv series for Disney’s new direct-to-consumer platform. 26th April - LucasFilm announces a new animated TV series - Star Wars Resistance. 28th April - Snooker’s ‘DESTROY ALL JEDI: The unfinished Tarantino-inspired prequel edit’. 13th May - IlFanEditore’s The Chosen One: A Star Wars Story - ROTS Prequel Edit with footage from Eps I & II. 18th May - timemeddler’s ‘4k77 released’ thread. 23rd May - Chewielewis’ 'Phantom Menace ‘99 - HD Theatrical Version’ project. 24th May - DrDre’s 4k77 - shot by shot color grading project starts. 24th May - paja’s ‘SOLO: A Star Wars Story: Fan Edit Ideas’ thread. 25th May - ‘Solo : A Star Wars Story’ is released (US date). 5th June - DrDre’s 4k77 - reel by reel color grading project commences. 23rd June - Mark69’s Box art (and more) for Bluray Set of Harmy’s Despecialized Editions project. 19th July - Lucasfilm announces new episodes of The Clone Wars. 29th July - Hal 9000’s The “Custom Special Edition” That Will Likely Never Be project. 31st July - ronwlim’s The Disney/Fox acquisition… thread. 31st July - 44rh1n’s “The Fellowship of the Ring” Extended Edition Color Restoration project. 1st August - Episode IX begins filming. 26th August - 15 MaF’s Blade Runner - The Analogue Cut fan edit. 24th September - Gary Kurtz passes. 1st October - adywan makes available Michel Parbot’s “The Making of The Empire Strikes Back” Documentary (full version). 7th October - ‘Star Wars Resistance’, a new animated tv series, airs on the Disney Channel. 22nd October - JawsTDS’s ‘4K83 Released’ thread. 2nd November - Anjohan’s Star Wars: Episode I - The Ancient Lore fan edit is released. 11th November - Williarob’s ‘Project 4K80’ thread. 17th November - saw the 40th anniversary of the release of The Star Wars Holiday Special. 25th November - poppasketti’s The Last Jedi: Rekindled fan edit is released. 30th November - saw the first episodes of the Galaxy Of Adventures animated series air online. 11th December - railerswim starts on his UHD Blu-ray Authoring - Technical Discussion thread. 12th December - The cast of the forthcoming live action SW tv series The Mandalorian is announced. 15th December - Anjohan’s Harry Potter and the Order of the Phoenix - Revisited fan edit is released. 19th December - Jay; the founder, site owner and admin of the OT.com announces that after near-on 16 years… he will be stepping down from many of his roles here. 27th December - Jackpumpkinhead’s Rogue One - The JPH Edit fan edit is released. 2018 was seemingly the year for announcements for all things Star Wars… with Game Of Thrones’ David Benioff and D.B. Weiss to write and produce a new series of Star Wars films, a live-action tv series The Manadalorian, a Cassian Andor live-action tv series, two new animated tv series - ‘Star Wars Resistance’ and a short animated series in ‘Galaxy Of Heroes’ (both of which also aired this year). 2018 also saw both the cinematic and home format releases of Solo: A Star Wars Story. March 10th saw the OriginalTrilogy•com celebrate it’s 15th year online - a feat that not many sites or fan forums have acheived. 4K77 (Star Wars) was released this year - in 1080p and UHD formats; shortly followed by 4K83 (Return Of The Jedi) in the same 1080p and UHD format - from 35mm film sources by the good people at thestarwarstrilogy.com. 4K80 (Empire Strikes Back) is being worked on - yet will take some time to complete. December saw OriginalTrilogy•com owner & admin Jay announce he was stepping down from many of his roles here after near-on 16 years. Whatever the future holds for him (Jay will still providing the OT•com with his invaluable tech support and knowledge - nobody else knows how to turn it off and on again 😉) we wish Jay all the very best for the future - and many, many thanks for his tireless work and efforts (much of it unseen) in creating, funding, maintaining, and evolving this unique forum since it’s humble beginnings way back in 2003. And for being the catalyst in building us this great Rebel Base from which the community here operates from. Anchorhead & SilverWook be taking over the control of all site content and day-to-day operations from 1st February, 2019. Donations will be required from this date onwards to cover the site’s monthly overheads - more info can be found here. 20th December - ‘Episode IX : as yet untitled’ is released (US date). Well, we all went out with a bang! early 2020 - The universe runs out of room for repeated toxic negativity - and gives up. The universe then starts to shrink very quickly, until it is destroyed. No one is very angry any more, and this is widely considered a good move - sorry Douglas. Secondly, the ’How do I do this?’ on the OriginalTrilogy.com - some information & answers to queries thread should also hopefully be of some help as to many of the functions of the site, along with other related info as well. Finally, the Announcements Section - including Site Rules & Guidelines, Fan Edit & Preservation Rules & FAQ, as well info for Signatures, Links to Downloads, and Plot Spoiler Policy (and much more) may be of use too. Immense thanks to zombie84 for allowing me to use, edit, abridge & update his comprehensive editorial piece from SSW•com as part of this thread - and also to doubleofive for getting me the ‘greenlight’ to do so. As ever, please let me know if you see any incorrect info or broken links - or have any suggestions for content to be included in here - thank you. Wow, thank you for this useful topic ! Thank you to everyone administering this site! Absolutely incredible, thankyou for documenting in one place. It is these positive and creative outpourings that make me proud to be a Star Wars fan and part of this community. Great stuff. I remember that 2015 site theme… yikes. It’s much better now. If we had nominations for Thread of the Decade, this would be it. This is really wonderful, not just for those of us who’ve been hear a while, but especially for new members. Thanks so much for compiling this. This brings back a lot of memories and all good ones. This site long ago became the heart of SW for me and still continues to be. Your 2020 section sounds really mature. Not!! Just a little humour there at the end of a long post - also with an attempt to put into context some of the seemingly endless toxic negativity in fandoms of late, with a play on a quote from Douglas Adams’ Hitchhiker’s Guide To The Galaxy.